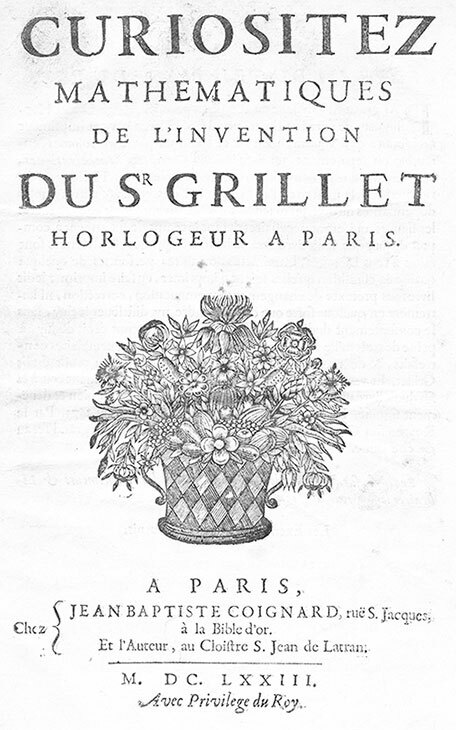 In 1673 the Parisian mechanician and watchmaker of His Royal Highness King Louis XIV—René Grillet de Roven (see biography of René Grillet), published a small book Curiositez mathematiques de l'invention du Sr Grillet horlogeur a Paris. 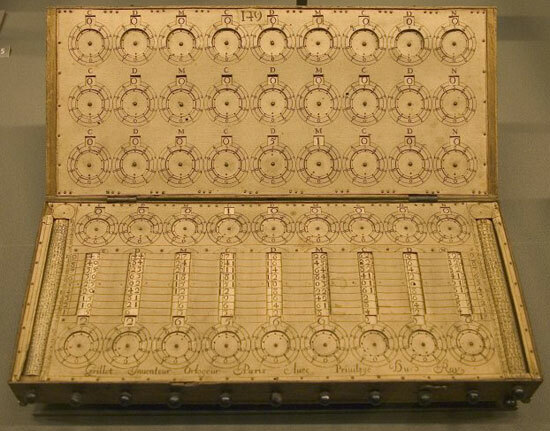 The book describes several different inventions, but the majority of it is devoted to his arithmetic machine (a simple calculating device, created by him). For some reason however, the Intendant of Police in Paris seized the book (most probably for privilege infringement, because in his book Grillet described also a barometer, for which he borrowed the construction of another Parisian instrument-maker, Hubin, without mentioning him). 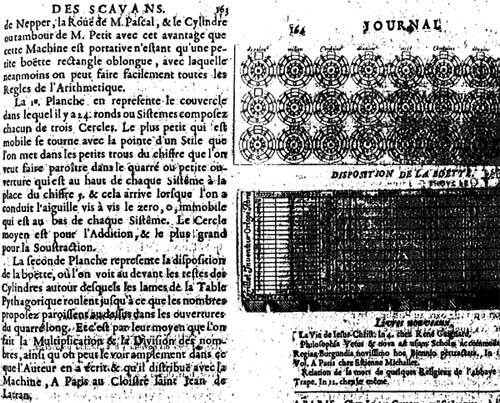 Five years later, in 1678, in the earliest scientific journal published in Europe—the french Le Journal des Sçavans, appeared a short description (3 pages text and 1 page sketch) of the device, so called nouvelle machine d'arithmétique. René Grillet obviously was so obsessed with keeping his design of the machine a secret, that he does very little to enlighten its mode of operation. 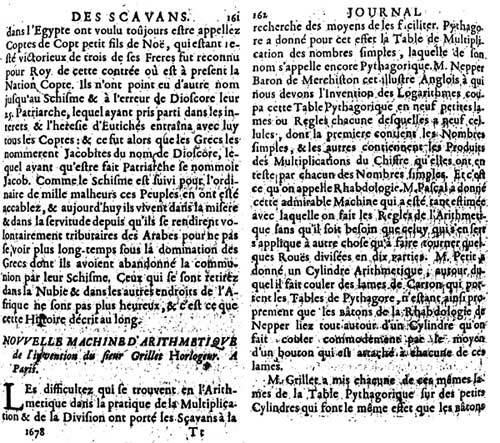 After telling his readers that the idea for the machine stemmed from the rulers of Napier, mentioning that Pascal had invented an admirable machine for doing arithmetic, and that Petit had given us a cylindre artihmetique (the French physicist Pierre Petit created in early 1650s a kind of Napier's bones engraved on a cylinder), Grillet stated that his device combines the wheels of Pascal with the cylinder of Petit, in order to provide a wonderful machine, which would perform all the arithmetic operations. 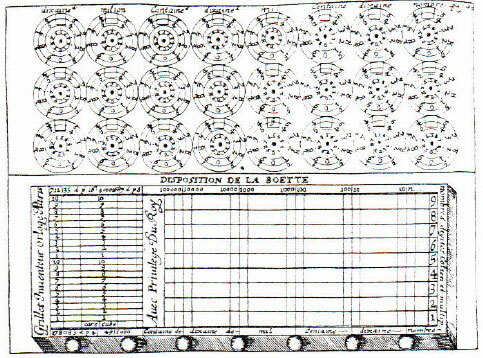 The sketch depicts a box with 24 sets of wheels (3 rows by 8 wheels) on the lid. Each wheel consists of several concentric circles, while the bottom of the box contains a set of Napier's bones, engraved on cylinders, reminiscent of those, described some 20 years ago by Gaspard Shot. The organization of the machine was rather simple, with no connection between the group of wheels on the lid, which means, that tens carry cannot be performed automatically. To perform an addition or subtraction on the lid dials, the operator would set up the first number on the upper line of wheels, the second number on the middle line of wheels, and then to perform the operation mentally, setting down the digits of the answer on the lower line of wheels. The wheels would have found theirs main use in adding up the partial products, generated by the set of the cylindrical Napier's bones, located in the lower part of the machine. Perhaps the most advanced aspect of Grillet's machine was its size—it was small enough to be carried in a pocket (see the photo below.) Dimension are: 14.5 x 32.5 x 5 cm, weight 990 g. Materials used are: wood, cardboard, paper, brass, and glass. The reason of Grillet's striving to keep the mode of operation and internal structure of his device as a secret can be understand by the fact that he tried to make money from his machine, exposing it for a fee at fairs, charging a silver coin to see it operate. It is known, that in 1673 the machine was exposed in Paris, at the Cloistre S. Jean de Latran and Quai de l'Horloge, №49. In 1681 the machine was exposed in Amsterdam, Netherlands. There is even some information, that Grillet tried to produce his machine in series and to sell it, but obviously without great market success. Only two copies of Grillet's machine survived to the present day, both in the collection of Musée des Arts et Métiers in Paris.